ROCHESTER, N.Y. -- The Louisville Bats blanked the Rochester Red Wings 2-0 Wednesday night at Frontier Field, before a crowd of 9,139. 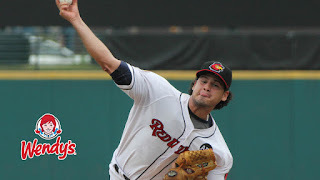 The Wings host the Norfolk Tides (Orioles) in a doubleheader Thursday beginning at 5:05 p.m.
Red Wings starter Stephen Gonsalves made it through the first two innings without allowing a hit, before Blake Trahan singled in the top of the third. Homer Bailey started on the mound for the Bats as part of a major league rehab assignment from the Reds. After allowing a walk and a hit in his first three batters, Bailey settled down and struck out three of the next seven batters he faced. After Kennys Vargas led off the bottom of the fourth with a single to right field, LaMonte Wade hit a hard line drive to left, but a diving catch by Phillip Ervin stifled a potential go-ahead RBI. Gonsalves' day was over after six innings pitched, allowing zero runs on three hits, five walks, and three strikeouts. Gonsalves threw 100 pitches, 56 of them for strikes. John Curtiss, pitching in relief of Gonsalves, found himself with runners on second and third and one out in the top half of the seventh when Trahan attempted to squeeze Stuart Turner home from third on a bunt. Curtiss, however, responded quickly off the mound and met Turner at home to tag him out, stopping the Bats from putting the game's first run on the board. Curtiss then walked the next batter to load the bases, and a single by Ervin scored Chadwick Tromp to give Louisville a 1-0 lead. Jimmy Herget took the mound in the top of the eighth, ending Bailey's day after seven innings pitched, having allowed zero runs on four hits, three walks, and three strikeouts. Bailey threw 110 pitches, 67 of them for strikes, as part of arguably one of his best pitching performances of his rehab stint. The Bats added a run in the top of the ninth inning against Tyler Duffey for a 2-0 lead. In the bottom of the ninth against closer Kevin Quackenbush, the Wings put the tying runs on base with one out after singles from Wade and Andy Wilkins. However, Quackenbush struck out one and got pinch hitter Edgar Corcino to pop out to center, ending the game. The Bats out-hit the Wings 8-6.